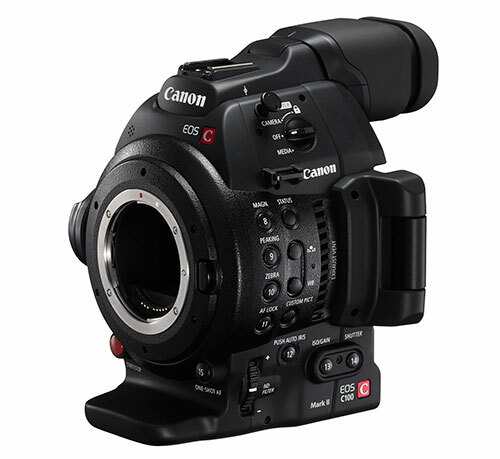 Did you like the Canon EOS C100 Mark I? 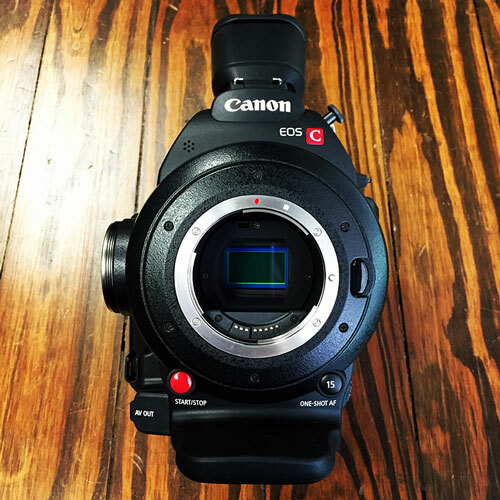 Then you're going to love the Canon EOS C100 Mark II! It's everything the first model was and A WHOLE TON MORE! Smart guys in lab coats took this baby over the top. Slap your Canon EF, EF-S, and EF-mount CN-E Cinema lenses on this work of art of a camera and just try to stop the creativity from exploding out of your head and onto the screen. It's the same super 35mm sensor, but with a new and improved Canon DIGIC DV 4 processor. What can it do that the old DIGIC 3 couldn't? How about better RGB processing, AVCHD and MP4 simultaneous recording, 59.94P overcrank recording, Dual Pixel Auto Focus and facial recognition focusing, wireless video file transfer, Cine-Log LUT, GPS module support and an expansive variety of workflows? 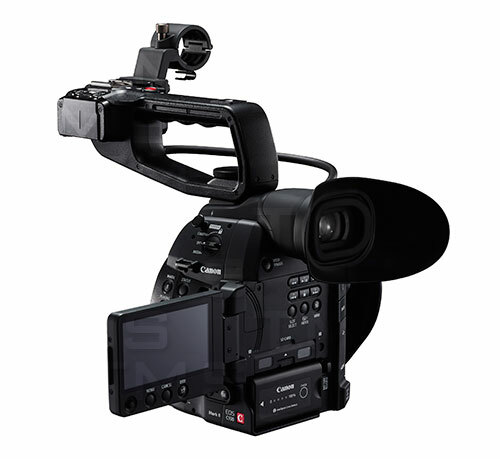 The most physically noticeable changes include an all-new 270 degree rotating OLED screen, a large C300-like EVF and the relocation of commonly used buttons. 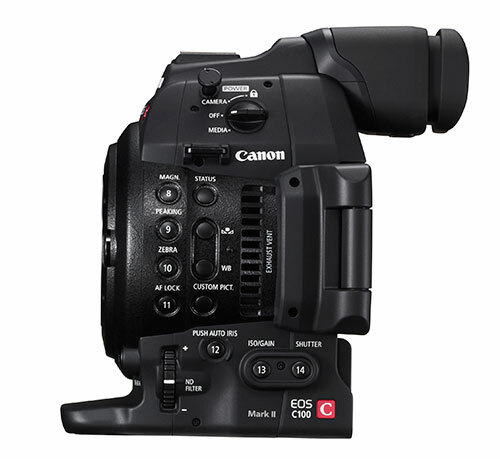 The C100 Mark II also includes a scratch track microphone on the main part of the camera body, so the user can still capture some kind of audio even when the handle is not attached. The REC buttons are now undeniably RED. The translucent SD card cover/window makes it easy to see if media has been inserted. There are more assignable buttons than the Mark I and changing out the battery is more intuitive. Of course, included are all of the things you loved about the Mark I such as the built in mechanica ND filters, detachable/adjustable hand grip, detachable top handle with dual XLR inputs, built in stereo mic and audio controls. Canon Super 35mm CMOS Sensor. It is the same as the rest of the Cinema EOS super 35mm line of cameras. The same techniques that made the other cameras great, make this one just as great. 8,300,000 pixels max out the size of each photosite, which contains two photodiodes that help create a wider dynamic range. When used in conjunction with Canon's debayering algorithm the results are signal to noise ratios that allow for ISO settings that are off the chart. AVCHD and MP4 Simul-Recording. Not only can you record in two formats at once, but you can do so in many differing band widths up to 28 Mega bits per second in AVCHD and 35 Mega bits per second in MP4 format. The reason for two formats is to help serve any production need. AVCHD is usually used in a professionial application, where as MP4 is more accepted among consumer devices so dailies can be reviewed on a producers hand held rather than waiting for the DIT to transcode it.